South Nags Head, North Carolina, is a 5 mile long, 200 meter wide, strip of beach cottage development at the south end of town of Nags Head. The town borders on the Cape Hatteras National Seashore to the south. This stretch of shoreline is subjected to relatively high wave energy by east coast U.S. standards. Typical wave heights are around 3 feet but much higher during the frequent winter nor’easters. The net longshore transport of sand on this beach is to the south, probably at a rate of roughly 500,000 cubic yards of sand per year. 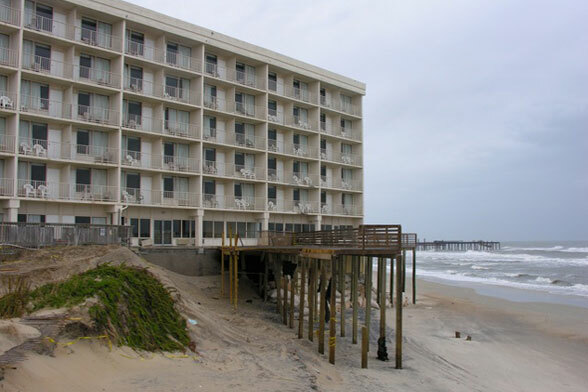 At the north end of South Nags Head, where the Comfort Inn Motel is situated, the erosion rate historically has been about 3 feet per year, and it progressively increases to the south, reaching an annual rate of 10 feet per year at the southern tip of the community. The sand beach is medium, slightly shelly sand with a high heavy mineral content. It would be an excellent beach for swimming, except for the fact that debris from fallen homes still exists in the intertidal zone. A number of cottages have fallen in along this shoreline and the city has not required much beach clean-up afterwards. The seven-story Comfort Inn Motel was the first high-rise along the beach on the Outer Banks of North Carolina. It was built well back from the shoreline, but inevitably erosion caught up with it and now seven rows of rooms stand out on the beach. This presents a marvelous opportunity for a good view of the sea and the waves breaking on the beach, providing a storm isn’t coming. This would be a motel that you would want to check the weather forecast before checking in! The nose of the building, sticking out on the beach, is protected by sand bags — the multi-ton variety. Farther down the length of this community, at least two dozen houses stand out on the beach seaward of the high tide line. Examination of aerial photos reveals that around Seagull Drive the buildings that front the beach today were on row three 25 years ago. The dream of owning a beachfront cottage has surprisingly come true for a number of cottage owners but their stay at the beachfront will be a short one! Seagull Drive used to be a U-shaped drive, but the end of the U has been removed by erosion. 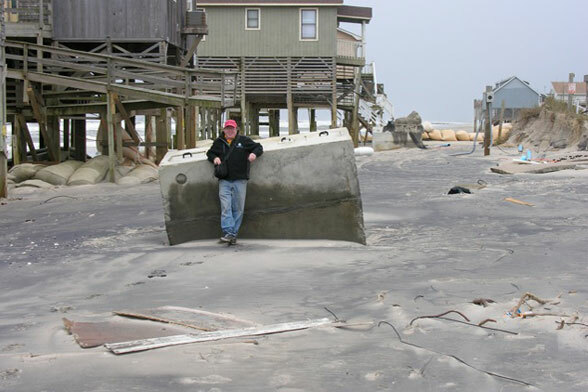 In November 2009, South Nags Head was hit by a relatively minor nor’easter, exposing a number of septic tanks and causing around 40 buildings to be condemned. If past history is any indication, dump-truck sand will cover up some of the septic tanks and the house rentals will continue unimpeded. But with each storm, a few more houses are abandoned. All of the houses on the beach are protected with sand bags. 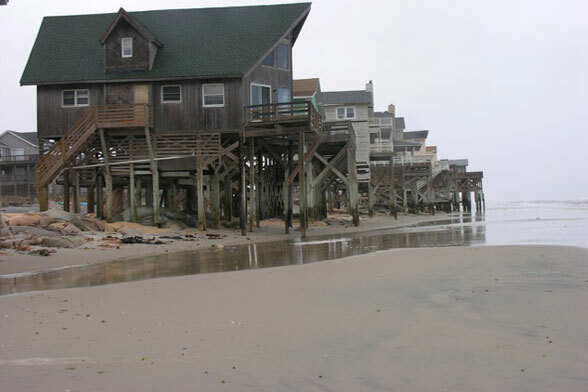 The history of South Nags Head clearly shows that there is no difference between a concrete seawall and a sand bag seawall. With time, usually within a decade, as erosion proceeds in front of the wall, the beach narrows and disappears. 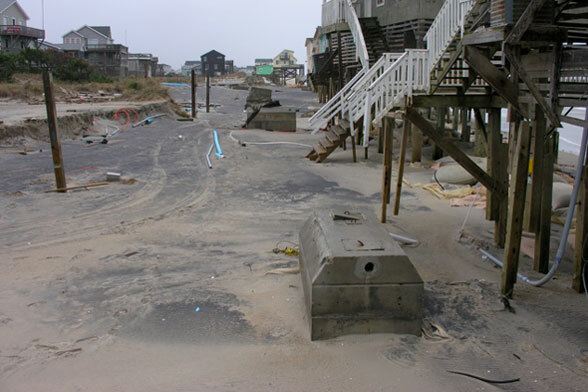 At several locations before the November 2009 nor’easter, it was not possible to walk along the beach even at low tide. In other words, the seawalls had completely taken out the beach. 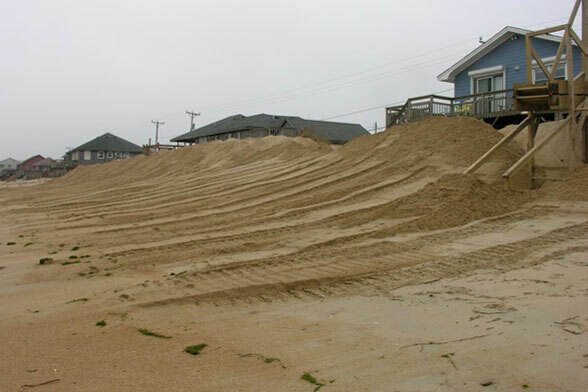 This phenomenon occurs because when seawalls are placed on an eroding shoreline, the erosion problem is not addressed. Thus, the beach continues to retreat until there is nothing left in front of the wall. South Nags Head also has lessons for us regarding sand bags. The sand bags rarely last more than five years. Typically they are torn up by storm debris, such as boards with nails sticking out of them, floating down the beach. The bottom line is that our Beach-of-the-Month designee is an example of how not to manage a beach. 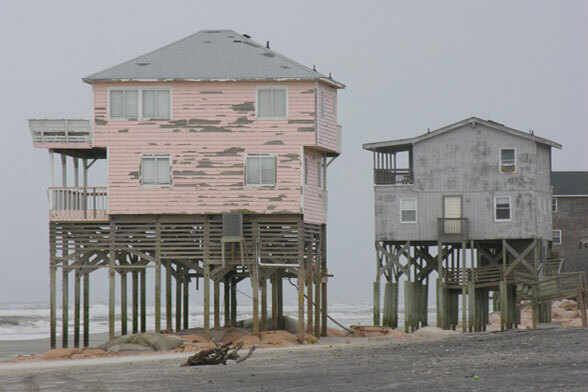 Houses are allowed to creep out on the beach as the shoreline erodes, sandbags are put in place which take away the beach, the septic systems that are frequently exposed by storms are surely polluting the waters, and concrete blocks, pipes, and cables from fallen houses continue to litter the beach.